Liam Billingham is a filmmaker based in Brooklyn, NY with an interest in documentary and fiction film. In his former life, he was a theater director who directed the premiere of the award-winning one-woman show Human Fruit Bowl in Europe and New York City. He is currently screening his film Future Perfect all over the USA and in production on a hybrid documentary/fiction film. He plans to shoot his first feature film next year. You can follow his work at liambillingham.com and on twitter @liamgbillingham. 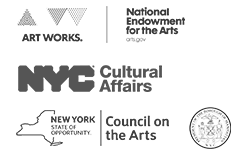 DCTV is supported in part by an award from the National Endowment for the Arts and by public funds from the New York City Department of Cultural Affairs in partnership with the City Council, and with the support of Council Member Margaret Chin. DCTV is also made possible by the New York State Council on the Arts with the support of Governor Andrew M. Cuomo and the New York State Legislature. DCTV is supported by the Manhattan Borough President, Gale Brewer. DCTV’s programming is also made possible by generous individual supporters like you.